You need a solar power bank to survive the zombie apocalypse or even just a weekend camping trip. That way, your electronics will work when electricity is gone (permanently or temporarily, depending on the circumstance). Just like you bank your money, you can bank electrical power. Use the sun to collect and store power in a power bank so you have it when you need it. Take a look at the 5 best solar power banks for home use. This summary will introduce you to them and prepare you for the reviews and the buying guide. 5 Best Solar Power Banks Reviewed: Which Meets Your Needs? ​This buying guide provides points to ponder as you consider what specific solar power bank is best for you. If you could have only one feature, what would it be? What, exactly, are you looking for in a power bank? Do you want to be able to charge more than one device at once? Do you want speed in charging? Durability? Portability? Think of how you’ll use it and what you’re hoping for. If you start by identifying your main need, you’ll know how to focus your search. You won’t be near a traditional power supply, but where will you be? Size needs and power supplies will differ depending on where you are. A power bank for the wilderness will be different from a power bank for an outdoor job within the city limits because in the wilderness, you’ll likely be away from standard power sources for much longer than if you’re in the city. Do you need a rugged device, or would a different style offer better features? Your location is important. Do you need a rugged device, or would a different style offer better features? Will you have reliable access to a USB or electric power source? Not all solar banks charge efficiently in the sun, and many use solar power as an emergency back-up only. If you will be away from traditional power sources for many days, take that into consideration as you look for the best solar features. Access to other power sources is an important consideration. Opt for a device with an additional battery or that holds a lot of charge. ​The AYYIE power bank is best for outdoor trips and is valuable for its charging ability and its extra tools. 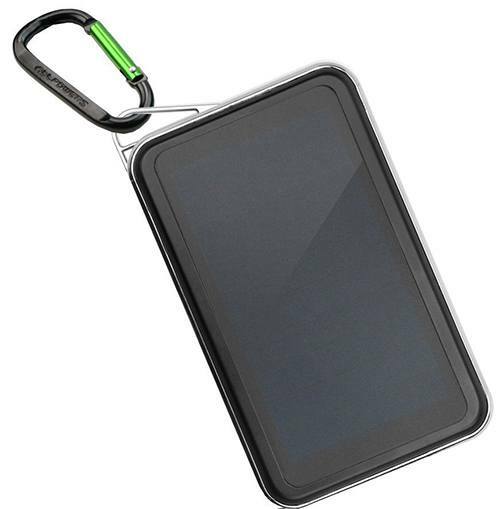 ​The JETSUN solar charger is the best power bank for rugged outdoor use. ​This solar power bank is one of the best around when it comes to fast charging speed. ​The Cobra strikes charging success with its fast performance and efficient dual solar panels. ​The Voltaic Systems 4.000mAH solar charger charges your device very quickly, and an extra battery ensures that you can count on this charger to work for long stretches at a time. When you’re away from electricity and your devices need recharging, use a good solar power bank. There are many to choose from, so which are best? Our solar power bank reviews are designed to help you determine what solar power bank to buy. The AYYIE Solar Charger 10,000 MAH Power Bank is an important component for your outdoorsy lifestyle. Whether you work outside, play outside, or both, this power bank is designed to keep your devices charged in many environments. This power bank charges multiple types of devices. You can charge up to two at a time. Durable construction makes it resistant to shock, water, and dust, so take it with you on your excursions, worry-free. Use it as a flashlight and as a compass, too. It’s a functional companion. Best suited for: When you’re outside on the job or on a rugged adventure and you need to charge your device turn to the tough and effective AYYIE Solar Charger 10,000 MAH Power Bank. Built for campers and their rugged outdoor lifestyle, the JETSUN Travel Power Bank Solar Charger performs. Charge up to two devices at the same time to keep those electronics working for you. This solar charger’s USB ports are universally compatible. Charge any device you have with you. Live the outdoor lifestyle while remaining techy. The JETSUN power bank offers a built-in flashlight feature. It stores solar energy by day so you can see by night. This charger is built tough. Clip it on your backpack so it soaks up the sun, and don’t worry about its safety. It’s shock-resistant, dust proof, and waterproof (don’t dunk it, but it’s rain- and splash-proof). Best suited for: If you venture into the great outdoors with your devices and need an effective, rugged, power bank, the JETUSN is a best choice for you no matter which devices you use. Need to recharge your phone or other device quickly? If so, the ALLPOWERS Solar Charger 1500mAh is your best bet. With its exclusive iSolar, Fast Charging Technology, this power bank reenergizes up to two of your devices more quickly than other solar power banks. It is self-monitoring and automatically adjusts its current and voltage as it works in order to reduce charging time. The power bank holds its power well. It can recharge your devices multiple times before it needs its own recharging. Best suited for: If a fast charging time is the main feature you’re after in a solar charger, this charger from ALLPOWERS is an excellent choice. The best charger for portability and solar efficiency, the Cobra comes to your rescue when you need it. The Cobra Electronics CPP 300 SP Dual Panel Solar USB Charger’s two large solar panels maximize the amount of light the power bank absorbs. It’s also possible to recharge the Cobra CPP 300 using a wall outlet. The Cobra is light and compact so is highly portable. It can actually fold like a flip phone. Best suited for: When you need a power bank that is lightweight, portable, and efficient, or when you want to charge three devices at once, give the Cobra CPP 300 SP a try. This is a power bank power house. The 4,000mAh USB battery pack makes the Voltaic Systems Portable Solar Charger about four times more powerful than other solar chargers. It’s fast at charging your devices, and it’s fast in recharging itself. The Voltaic Systems charger also boasts twice battery power as most other solar chargers. It comes with an extra so you can count on power for an extended period. Charge almost any USB device with this power source. You’ll need to prioritize your charges, though, because this solar charger only charges one at a time. Best suited for: Anyone who goes off the grid for extended periods of time might find that the Voltaic Systems 4,000mAH solar charger is the best choice. When you bank power, you can charge your devices anywhere you go. You can be miles away from electricity and still keep using your mobile devices. Are you devoted to sustainability and conscious about your health and the environment? If you're considering portable power banks, we think you are! For this reason you may also like to check out our guide to Non Toxic Home Cleaning Remedies and The Five Best Solar Lanterns For Camping And Home. Consider the five best solar power banks based on your unique needs, and choose the one that gives you the ability to survive the zombie apocalypse or go on grand adventures. Take technology will you anywhere you go. With one of these power banks, you can go anywhere.